For many families who have required the services of Birmingham Children's Hospital, news that it is the first standalone children's hospital to be rated "outstanding" is no surprise. The hospital was criticised eight years ago for having an insufficient numbers of beds, operating theatres and trained staff, but now the Care Quality Commission has praised the NHS trust for "working effectively to provide the best care" at the Steelhouse Lane hospital. Families told the BBC the accolade was long overdue. Frederika Roberts' daughters Charlotte and Hannah were both born with life-threatening heart conditions. Now aged 19 and 17, they have spent their lives travelling between their home in Doncaster and Birmingham Children's Hospital. "They both had different life-threatening heart conditions, and initially Charlotte was treated in Leeds which is nearer our home," Mrs Roberts said. "But when I was pregnant with Hannah, I was told about her condition and that the outlook was bleak. They recommended a termination." Through a family friend, she was told about a surgeon in Birmingham who might be able to help. "They agreed her situation was bleak but they gave us a glimmer of hope. 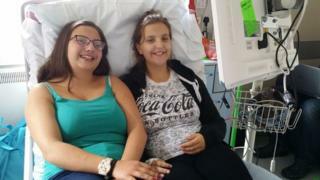 "She had open heart surgery at 10 months, and at 14, and now she's about to go into sixth form. She also wants to study medicine, and did work experience at Birmingham Children's Hospital. It was amazing. "We cannot thank the staff there enough for what they have done for us. "Charlotte was four when she had open heart surgery and it was quite drastic and ground-breaking at the time. "Hannah's surgery was also experimental. I really think that without them our daughters would not be here." Teresa Fletcher's granddaughter Lily was four years old when she was diagnosed with Muenke's Syndrome, where the skull doesn't grow at the same rate as the brain. She had major head surgery a few months later. "She had six or seven different consultants, and all made us feel well at ease," said Mrs Fletcher, from Coventry. "Even right down to the cleaners, they were so jolly around the kids. "For a bad experience, it was a lovely experience. "Lily was there at Christmas, and Father Christmas came along to meet all the children. My other granddaughter was there with her on the day and they gave her a present too. "All the children were really looked after. It made it a much better atmosphere. The staff wanted us to call them by the first names, it wasn't 'I'm doctor this, it was 'call me Pete'." Taking her son Ben to Birmingham Children's Hospital has been part of Nichola Welch's life since he was born with a cleft lip and palette 15 years ago. Ben had his first operation at the hospital at about four months old and has had further surgery, as well as regular appointments with staff including speech therapists and orthodontists. "The staff are just amazing," Ms Welch said. "To be fair I have never heard anyone say anything bad about the hospital." Ms Welch, from Tamworth, Staffordshire, said staff found the time and patience to put her son at ease, especially as having autism and ADHD could make him feel particularly anxious in hospital. "Staff are very good at explaining what is going to happen," she said. "They also talk to Ben and often it is me listening to what he is being told, rather than the other way around."